These pretty feather earrings are the perfect accessory for the summer festival season. 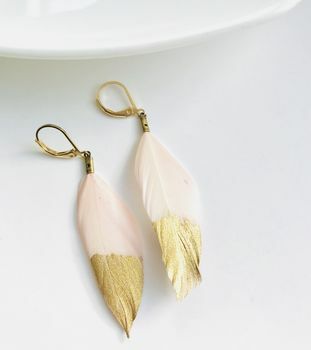 Pastel pink boho feathers dipped in luxurious gold and hung from hook ear clasps. Your unique Boho earrings will arrive tastefully packaged in a gift box or bag; would make the perfect gift! A real feather with gold plated findings. This product is dispatched to you by La Belle et la Bete.